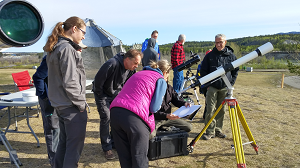 Are you a current, or future, instructor teaching Astronomy or Space Science? Become an effective implementer of active-learning instructional strategies. Learn how to transform your classroom. Consulta Meta I.M. Inc. believes that by including Astronomical education into the curriculum, it will permit students to better engage in deep learning, and life-long learning. Our goal is to help teachers and students learn more about Astronomy and also themselves. To enhance an understanding of, and inspire curiosity about, the Universe through education, workshops, activities, and research. Properly teaching Astronomy to our youth is of great value. It has been proven that pupils who engage in dynamic Astronomy-related educational activities at a primary or secondary school are more likely to pursue careers in science and technology, and to keep up to date with scientific discoveries (National Research Council, 1991). This does not just benefit the field of Astronomy, but reaches across other scientific disciplines. Several studies over the lat few years have indicated that investing in science education, research and technology provides a great return, not only economically, but culturally and indirectly for the population in general. The scientific and technological development of a country, or region, is closely linked to its human development index, a statistic that is a measure of life expectancy, education and income (Truman, 1949). More recently, C. Renée James wrote an article outlining the recent technological advances that we can thank Astronomy for, such as GPS, medical imaging, and wireless internet (Renée James, 2012). Astronomy and its related fields are at the forefront of science and technology; answering fundamental questions and driving innovation. Astronomy is interactive, fun, and dynamic. It gives students the chance to discover their Universe, through their own eyes!